Please note the year of mintage will be chosen randomly based on inventory. Also, the design may vary depending on the year of the coin. This British Gold Half Sovereign Coin is an easy way to add gold to your portfolio. This coin is composed of 0.1177 troy oz of .9167 fine gold and with a denomination of 1/2 Sovereign. 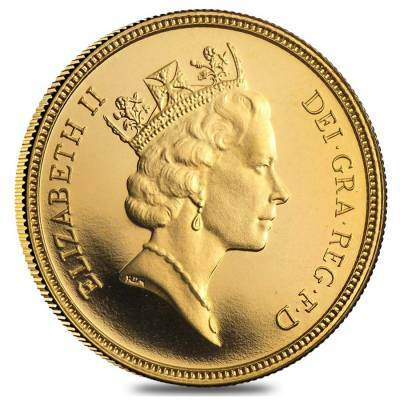 The obverse will most likely feature a bust of Queen Elizabeth II with the inscription "ELIZABETH II DEI GRATIA REGINA FD," which translates to "Elizabeth II, by the grace of God, the Queen." 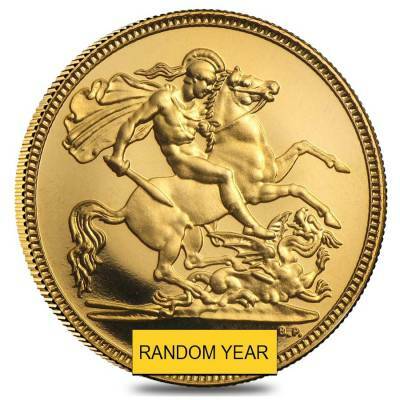 The reverse will most likely display St. George on his horse as he slays a dragon with the year of mintage below. This coin came quickly and safely without any signs of damage whatsoever. Thanks, Bullion Exchanges for the great price, and shipping. With this purchase, you earn 176 Bullionaire Bucks 176 BB = $0.18.